Two weeks ago I posted on The Third Lausanne Conference that is about to begin in Cape Town. Our city is starting to fill up with guests and speakers from all over the world… Jonn Stott, one of the founders of the Lausanne Congress will not be speaking at Lausanne, as he is retired from public speaking. But on his behalf, Christopher JH Wright will read a letter that John has written in honor of this historic event. I have a fantastic collection of John Stott books to GiveAway this week. CBD, our GiveAway book suppliers will have a book table at the Conference and in honor of the event I have not one but three books to give away this week!!! When I got these books I wondered to myself, “What does John Stott have to do with Lausanne?” and some of you might be wondering who John Stott is as well… John Stott is a Christian pastor who attended the first Lausanne Congress in 1974 and helped write the Lausanne Covenant. The Covenant provides a collaborative work amongst Christians world wide to grow the church and to spread The Gospel to all corners of the world. 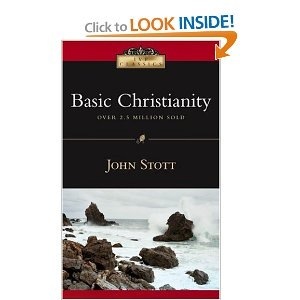 Basic Christianity by John Stott: This is one of those Christian Classic’s that everyone should read. I read it a number of years ago and just reread it!!! Wow I had forgotten how great it is!!! This book examines a number of fundamental questions regarding: “What Christianity is all about” and who Jesus was. He examines the historical basis of Christianity, no waffling, he writes straight down the line providing practical answers. Why I Am a Christian: This Is My Story This book describes Stott’s walk as a Christian and he gives six clear and logical reasons why he is a Christian. This book makes compelling reading and begins with his description, not so much in the typical way that “He found Jesus”… but rather that “The Hound of Heaven” pursued him. 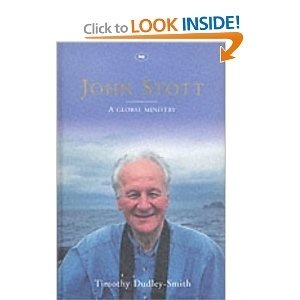 John Stott: A Global Ministry: A Biography of the Later Years, Vol. 2 This is the second volume in the biography of John Stott’s life. This is not a quick read, and if you enjoy a biography then you will love reading it and discovering about this man’s amazing life. It is not just a list of professional achievements, it explores his friends, his daily life and the amazing qualities that have defined his life: self-discipline, humility and a prayerful spirit. If you would like to win these fabulous book then go ahead and enter our GiveAway. The GiveAway works in the usual way, comment before the end of this coming Sunday, 17 October 2010, and we will draw and publish the winner next week! – I won’t respond to your comments as I do on our other posts because I don’t want to be included in our own giveaway. Hi there! Thanks for putting together such an extraordinary giveaway! (I would decline the books, by the way, we have them already). But we enjoy your comments and we’re sharing your contest with others. By the way, just a correction: John will not be speaking at Lausanne, as he is retired from public speaking. On his behalf, however, Christopher JH Wright (who could very well be a subject of a future GiveAway!) will read a letter that John has written in honor of this historic event. Prayers for your city at this historic time! Those books Look fantastic! 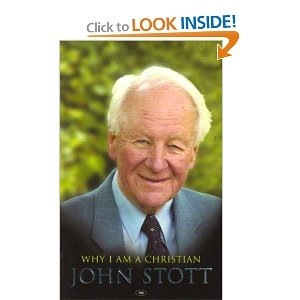 We have several John Stott books in our bookcase, It would eb wonderful to read the Story behind an amazing Christian. I have never entered one of your Give Aways before. Thanks for the opportunity. These sound great. It would be great to read all about this wonderful man. What a great selection of books. Would be a great read. I love John Stott! I got to hear him preach in London when I was in my teens. Amazing! We’d love to win these books, please enter us. Hope you are all having a great week, we’re being blown away this side today! It turns out I have two friends who will be attending the Lausanne conference. I am jealous on so many levels. Great giveaway! interesting selection of books.. count me in! BTW, I received the books that I won back in July this week. Many thanks. The children love them. I was totally surprised when they arrived, 3 months after they had been posted! My post office couldn’t believe it… but the postmark proved it. What an amazing man – we would love to learn more about him! Thanks! I have friends attending the conference as well as one serving and every time they share small aspects of it, I so wish I could go. This must be an inspiring man to get to know! Fulfilling God’s call! looks like interesting and inspiring books to read. I would like the opportunity to read some of his books too. Thanks for organising the Give-away. Please enter me to win! Sounds great! Yes please! We would love to enter! I actually haven’t ever read any of his books so it would be great to win! Hi, My uncle is attending the conference right now! I know it probably seems, like “who cares” to you, but he is as close to Africa that I will probably get. And it seems cool to me that I found your blog, and you live in the very town he is visiting because of this awesome conference, right now! Anyway, chances are very very slim, but if you see a very tall, very pale, middle aged man, with glass (and kind of a large nose) it could be my uncle! Hay Kristen – How exciting!!! My husband will be attending tomorrow and he is so excited to hear the speakers!!! Cape Town is packed with guests and it is just lovely!!! I will give him a description of your uncle just in case!! !